Magic Kingdom is the following musicians: Peter playing keyboards, harp, recorder, Freenote chime, Peruvian wooden flute, and percussion. Richard Hardy is on Irish Pennywhistle and Soprano Sax and Anthony Mazzella on Guitar. The album was recorded in Sedona from 2017-2018. I have concluded after several years of listening to various incarnations and fusions of new age music that the combination of world and new age is the most interesting and colorful listen I could hope for. It is always different and just about any instrument can serve as the lead if the mix is right. Peter’s main instrument is the heavenly harp. It is so precise and delicate, and it easily mixes with the other music and sounds provided on Magic Kingdom. Peter defines the term indie musician and the do it yourself attitude that is so strong amongst the folks that make up that culture and work ethic. It takes tremendous dedication, commitment and talent to produce a recording such as Magic Kingdom. The blend of instruments is simply sublime and the few tracks where you hear some vocals it is impressive as well. The vocals are an instrument as far as I am concerned and it is quite evident when listening to the tracks that provide that. 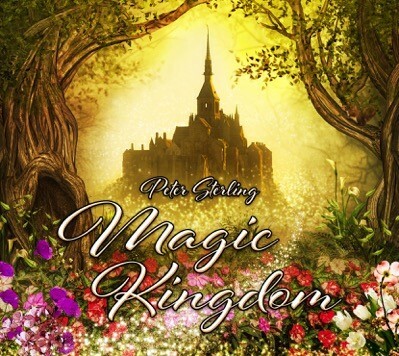 The closer and title track “Magic Kingdom” and “Tomorrow’s Child” are two fine examples of world-instrumental new age with just enough vocal styles to make it a meditative piece that you want to hear more than once. “Over the Bridge” features a sweet child’s voice, contributing to the purity and innocence of this listening experience. “Everlasting Love” starts off with Peter’s harp inviting the rest of the instruments into the mix then a jazzy tone comes alive with some soprano sax. I love that combination absolutely, it always works for me. I do love jazz so that makes the transition that much more delightful for my ears. So, in the end, what I got to enjoy was another musical stew brought to a simmer by many talented artists. Make sure you listen to Magic Kingdom and let it bring you joy and good vibrations, it is there waiting for you now.